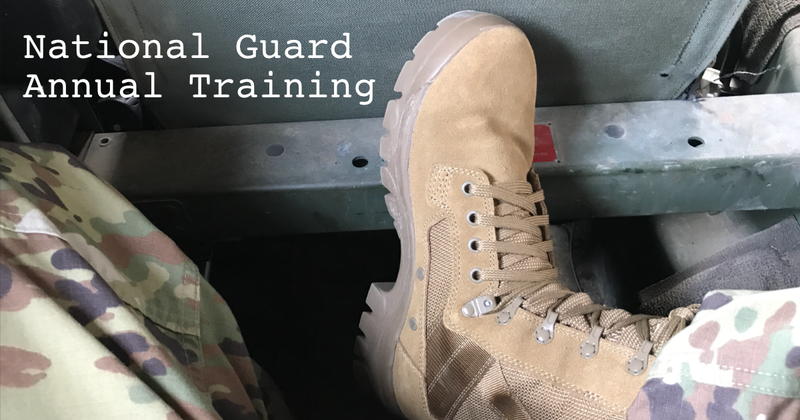 Starting today, I will be attending my first Annual Training as a National Guard soldier. I am a little nervous but also excited. It’s been over 20 years since I’ve been in the field with the military, and there’s a certain rustic element to it that I enjoy. I don’t know if it’s the hardship or the environment (likely both), but there’s something about it that I am drawn to. I feel very fortunate to have the opportunity to be serving at my age, and I work hard to earn that opportunity and to bring value to the unit, the state, and the Army. The one area I am concerned about is nutrition. Military food tends to be very calorie and carb rich, and for good reason: most field work is very physically demanding, and sometimes meals only happen once a day. That means those meals need to be able to sustain soldiers for an entire day’s worth of calories. I will be working had to ensure I don’t eat too many carbs, but I don’t know how successful I will be able to be. I am taking RX Bars, some Epic bars, and other Paleo-friendly treats with me to help me on those days when the meals are unacceptably carb-rich. I won’t be able to run every other day, either. Well, to be more clear, I won’t be able to run at all. We are not going to the field to perform unit PT; we are going there to practice our jobs. I was hoping to be able to run a little each day, but I was told that we will not have access to daily showers. I don’t know if I will have Internet access. I’ve been told that we will have cellular service, so it’s a possibility, but it’s also spotty. Therefore, all my posts for the next two weeks are pre-written and will not be reflecting my experiences on Annual Training. I will try to write while I’m out there, but they will be saved to a laptop I will have with me and the articles will all be uploaded once I get back. They will then be released on the same schedule my current articles are posted: one daily at 8 am. I will miss my wife, my warm bed, and ready access to showers. I will miss AC, home-cooked food, and the Internet. But I will be gaining experience in the event I ever have to deploy, and that is very important to me and my job in the National Guard. I’ll be okay, and I look forward to writing my articles back at home in the AC on my iPad.